Unbelievably, we are already halfway through our project in Kitui. So much has been achieved in this short time, but there is much still to be done, and no time to waste. We were happy to welcome our friends Mark and Louise from CAFOD in the UK, who were able to see first-hand the hard work being done all around the project site, look out for their reflections in your next postal update. 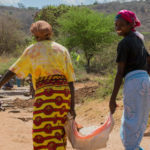 Your support makes all of this work possible – please accept our warmest thanks, and keep Kitui in your prayers. 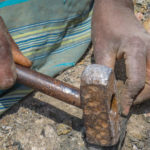 New tools have been provided as the old ones have been worn down. 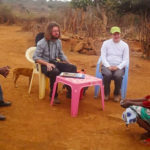 CAFOD staff from the UK visited the project and interviewed some of the community. Materials are being gathered for the remaining sand dams. 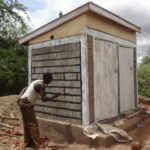 Work has begun on building safe, hygienic latrines – a hugely important improvement for the community.